MNSC dinner at Kwan Kee Clay Pot. 2009 Comte Lafon Meursault 1er Cru Charmes - opened about 5½ hours prior to serving. Nose of lemon, oak, flinty. Nicely balanced on the palate. 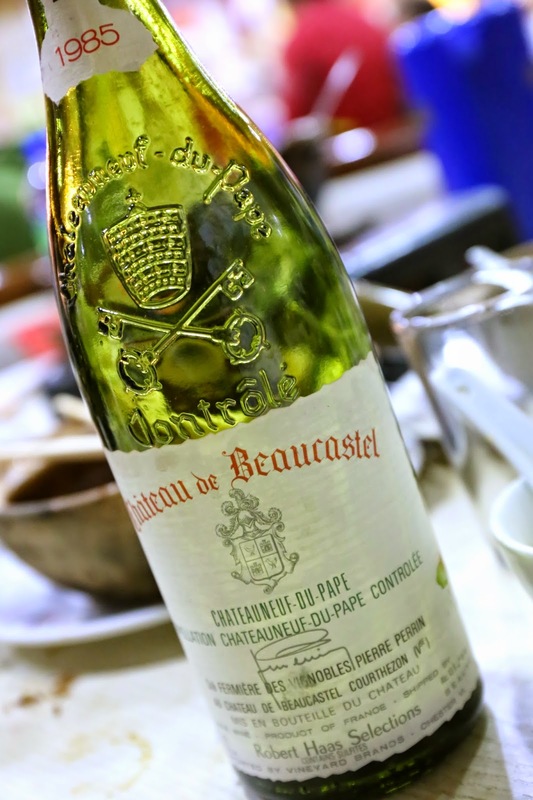 1985 Beaucastel - opened 2 hours prior to serving. Some fruit here and pretty nice. 1986 Henri Bonneau Réserve des Célestins - as someone said, this was "101% corked"... and the cork actually was loose and dropped into the bottle. Nose of sweet grass and cardboard. 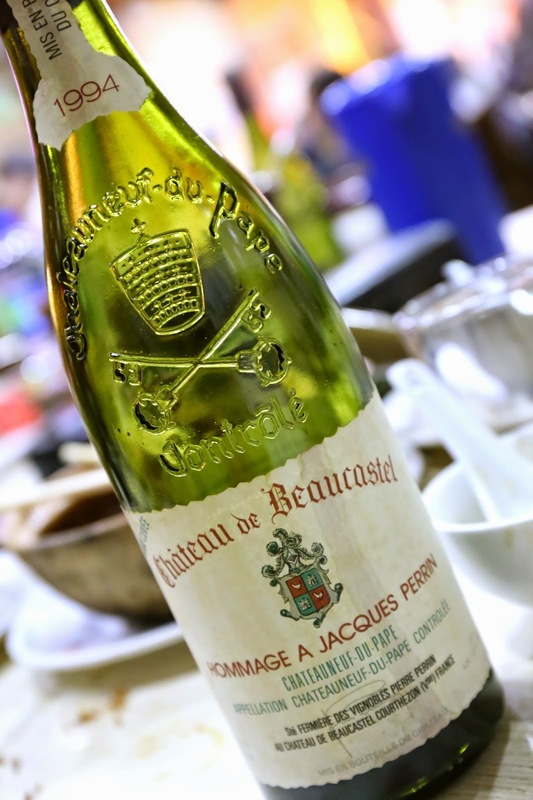 1994 Beaucastel Hommage à Jacques Perrin - very farmy, pretty strong animal notes, savory and smoky. Absolutely perfect with the mutton brisket. 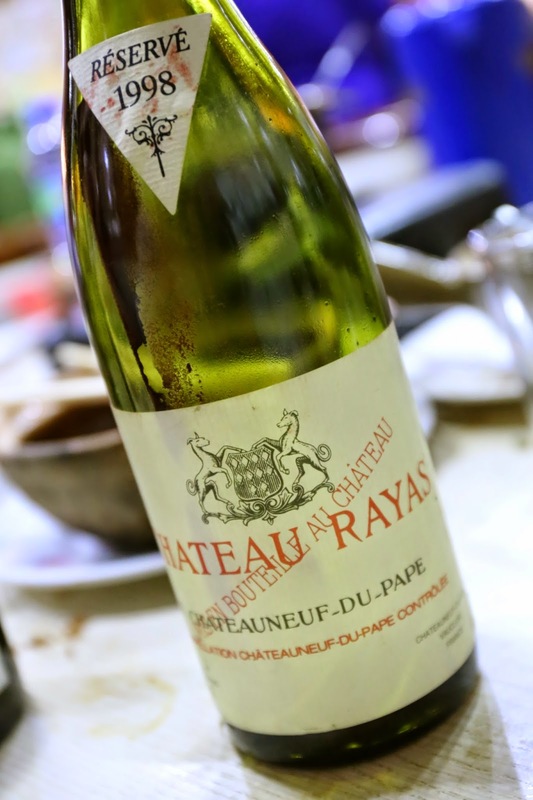 1998 Rayas - what a beautiful wine! 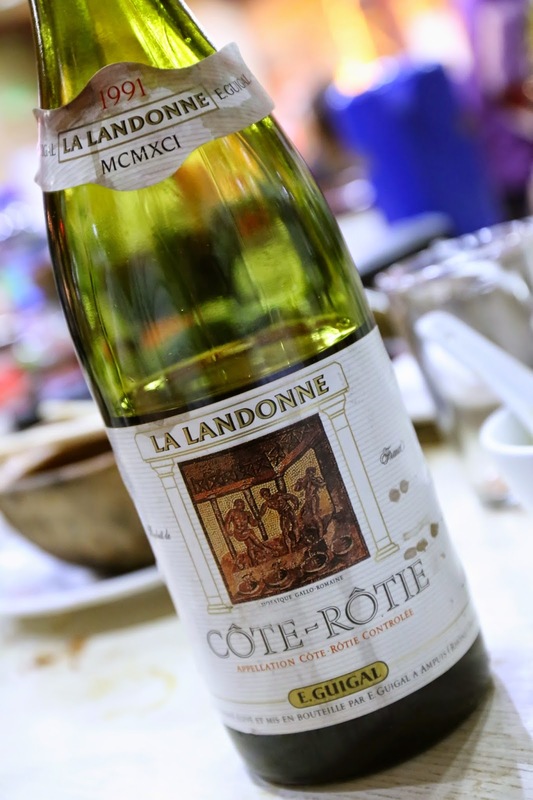 Really sweet and jammy on the nose, with lots of strawberries and lychee. Body was much lighter than I remembered from previous bottles. My favorite wine of the evening, just edging out the Célestins. 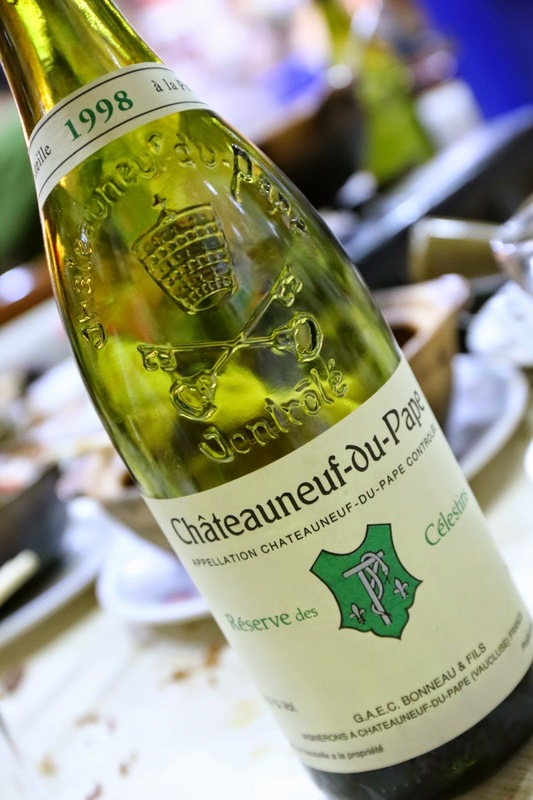 1998 Henri Bonneau Réserve des Célestins - double-decanted 2 hours prior to serving. Good fruit here, but also plenty of concentration. A little smoky and savory. A beautiful wine. 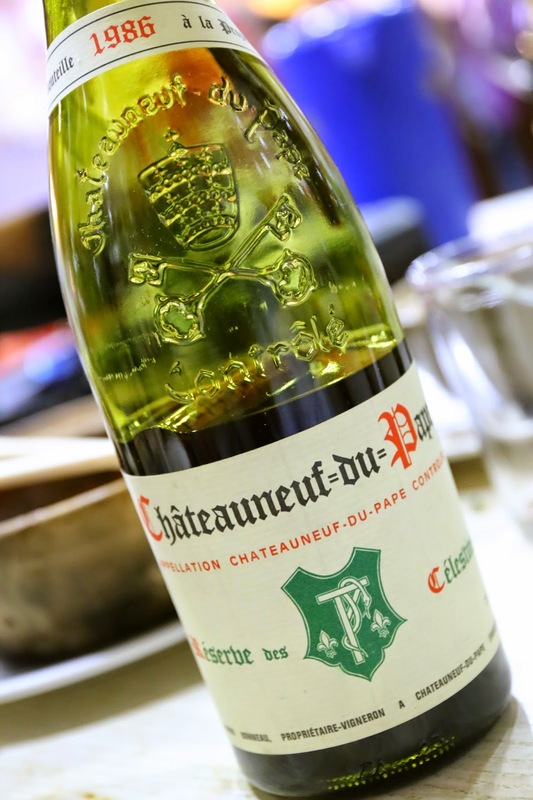 1991 Guigal La Landonne - a little smoky, exotic, plenty of coconut butter, almost seemed a little cooked, and slightly "dirty". Surprisingly not my favorite wine tonight, but still drinking well. Our two favorite wines of the evening were clearly the pair of '98s. The interesting is that both wines were made from the same grape - grenache - but they could not be more different stylistically. At a similar dinner 5 years ago, we made the analogy between these two wines (from the 1990 vintage) to two different types of women. Tonight they were described as the Malicious East and the Venomous West (東邪西毒) - a reference to characters from the novels of Jin Yong (金庸).